I’m happy to share with you my English translation of a short documentary about Vaganova Ballet Academy, featuring past and current Academy students: Maria Koshkareva (class of Lyudmila Komolova), Alexandra Khiteeva (class of Irina Sitnikova) and Ruslan Stenyushkin (class of Nikolai Tsiskaridze). DIRECTOR Vitaly Bezmennikov, SOUND Svetlana Cherkasova, CAMERA Vladislav Kiyatkin, PRODUCER Ilina Vakhitova, EDITING Mila Minkina. How did you first get into ballet? 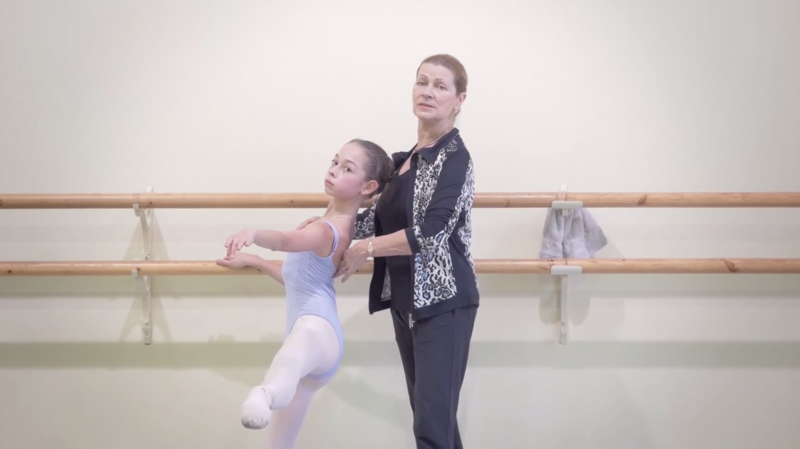 Maria: My mom took me to see my first ballet when I was just two years old. I don’t know why, but I loved it so much that I couldn’t think of another career for myself. Back at home, I had all the costumes for the three acts. My mom would sometimes put “The Nutcracker” CD on for me, and I would dress up [and dance]. I would jump onto the couch during the partnering bits and pretend that I was being lifted up. Ruslan: My mom encouraged me to do ballet. I wasn’t too keen on it myself; I didn’t consider it a proper occupation for a man. I remember entering the Voronezh Ballet Academy for the first time and being enthralled by the atmosphere of the place – the halls, the classes, everyone standing in proper ballet positions – I was hooked. Then, when I started training, it was the process that made me fall in love with ballet. Alexandra: Once, [when I was little], they were playing this song on TV, and I started to twist to it funnily. That was when my parents realised that [dance] would be a good career path for me. Do you remember how you got into the Academy? Maria: I got in straight away. Ruslan: I was very nervous because I didn’t know what to expect. When Nikolai Maximovich told me that I will be joining his class, I was incredibly happy. I couldn’t believe it. I will probably remember that moment for the rest of my life. Alexandra: I remember going to the audition. I was wearing my little coat, with my hair all nice and neat in a bun. I remember being scared and hiding behind my mom. There were other girls there who had been through the audition process once before and knew exactly what was going to happen at each stage. They were so sure that they would all get it this time, and I was thinking to myself: “They know everything and I know nothing. There is no way I will get in”. In the end, I was the one who passed the audition. Maria: Irina Ivanovna Komolova. I like the way she teaches us very much. She explains everything very clearly and corrects us when we need it. She has taught me to dance very cleanly. She is kind. Most of the time. Alexandra: Irina Alexandrovna Sitnikova. She is an incredibly resilient person. I think she is capable of withstanding any calamity. She can, and often does, raise her voice at us during the work process, but outside of class she is always there for us, always ready to help. When I was in the hospital, she would visit me and bring me whole bags of fruit. It was so sweet and really helped me during that time. Ruslan: Nikolai Maximovich Tsiskaridze. I’m very grateful for everything he has done for me, he has completely changed my life. He is a very tough teacher – he gets the result he wants by hook or by crook – but he is a good and kind person; amiable and cheerful. He would give us sweets during long rehearsals and would generally feed us up. Are your teachers tough on you? Alexandra: I get scolded all the time. Last year, in the weeks leading up to the exams, Irina Alexandrovna would constantly throw me out of the classroom. Ruslan: They scold her to give her extra incentive and to make her work harder. We get scolded too, of course. Messing up in a big way can earn you a bit of a clip on the back of the head, but it’s not a big deal. What’s a day at the academy like? Alexandra: The [academic] exam periods are the worst. You return to the dorms at 8pm, after a full day of rehearsals, and you’re so tired that you can’t feel your legs under you, but you have to study for a test you have the next morning. It’s tough, but it’s a rite of passage. It all works out in the end. Have you ever had a mishap during a performance? Alexandra: Yes, I had one last year, when I danced the Snowflakes in “The Nutcracker”. Before we went on, Little Masha danced a pas de deux with the Little Nutcracker, during which the Little Nutcracker dropped his sword. He ended up leaving it behind when he exited the stages, and the Snowflakes had to dance around it. Everyone panicked because the sword was right in the middle of the stage and it was a huge tripping hazard. I remember praying to all the Gods out there to keep me from stepping on to that sword as I was dancing right around it. Ruslan: Once, during a pas de deux, I tried to lift my partner out of a fish dive and realised that I could’t move her away from my torso because my crucifix got caught on her tutu. I couldn’t move an inch. We were wearing brand new costumes, and Nikolai Maximovich had warned me beforehand that he’d pull my head of if I ripped them. Maria: Once, when I was dancing Little Masha in “The Nutcracker”, I thought that the heel of my pointe shoe would slip off my right foot. I fixed it behind the Christmas tree at one point during the performance. I hope no one had seen that. What do you feel before and during the performance? Alexandra: I feel terribly nervous before I go on. When you’re out there, the most important thing is to avoid messing up. But once you’re dancing – you’re happy, you’re one with the music and your role. Then, during the curtain call, you’re relieved that everything went well. People are clapping and shouting “bravo!” That’s a very happy moment. Maria: It’s scary. My heart races and my mind is completely blank [before I step on to the stage]. When I dance, I think about my role and its meaning, and I try to remember all of my teacher’s notes. Ruslan: There is some mild anxiety before you go on, but it fades away once you’re out there. You just try to dance, enjoy yourself and make people happy. Some thoughts on the Vaganova Ballet Academy’s “The Nutcracker”. Alexandra: “The Nutcracker” is the Academy’s tradition. New Year’s holidays just would not be the same without it. Ruslan: It’s the best thing about the New Year’s. Posted in UncategorizedTagged ballet, translationBookmark the permalink.